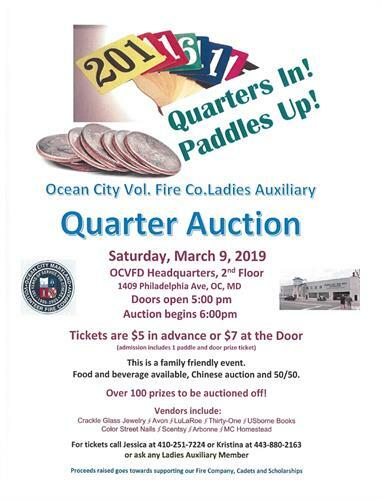 OCVFC Ladies Auxiliary is holding its 2nd Quarter Auction on Saturday March 9th doors open at 5:00 and Auction begins at 6 pm. We already have some wonderful prizes and more are coming in everyday! Refreshments available. Chinese Auction, Raffles and 50/50. Reserve your tickets today! We had a very busy event last year! We are having the following Vendors Crackle Glass Jewelry, Avon,Arbonne, Usborne Books, LuLaRoe, MC Homestead, Scentsy, Color Street Nails, 31. If you are interested in making a donation or you want tickets please let us know! For tickets contact Jessie 410-251-7224 or Kristina.443-880-2163.